« Will the Tories Take Advantage of a Golden Opportunity to Save the United Kingdom? It’s not that much fun to be a libertarian, at least if you work in public policy. You spend your days hoping that “Public Choice” can be overcome, which means you’re laboring to fulfill Sisyphean tasks. Trying to convince politicians and bureaucrats to voluntary give up power and control over the economy. Good luck with that. 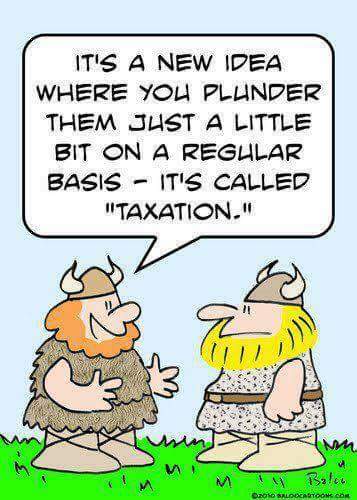 Trying to convince voters that it’s not right use government coercion to steal other people’s money. An increasingly hard task. Needless to say, these are not easy tasks, which is why most of my time is spent playing defense. In other words, I’m trying to prevent government from getting even bigger. But what if there was an opportunity to wipe the slate clean and start all over? Imagine a libertarian fantasy world, where proponents of freedom decide the proper size and scope of government? Well, that fantasy world exists, sort of. It’s called Liberland, an island in the Danube River that isn’t claimed by either Serbia or Croatia. So a group of libertarians, led by Vít Jedlička, claimed the island and announced the creation of the Free Republic of Liberland. That’s the good news. The bad news is that neither Serbia nor Croatia recognize Vit’s claim. Indeed, Croatian police arrest people who set foot on the island, which is rather strange since Croatia says the island isn’t Croatian territory (Wikipedia has the details on Liberland’s status). Notwithstanding these obstacles, the Liberland community is relentlessly hopeful of a good outcome. Indeed, they just held a conference to mark Liberland’s second anniversary. And I was asked to speak about the ideal fiscal policy for this new country. Here’s my speech, which begins with a discussion of government as a “stationary bandit” and then explores some of the theoretical issues of setting up a freedom-oriented society. Yes, I realize I’m talking about the theoretical nature of a theoretical state, but I very much enjoyed this opportunity to engage in a Walter Mitty-style dream about how Liberland might operate. And I even had Liberland’s president as an assistant for my talk. I discussed the Rahn Curve and cited the data showing that the federal government was a very tiny burden for much of America’s history. I also pointed out that the burden of government was similarly modest in other western nations during the 1800s and early 1900s, which was when those countries went from agricultural poverty to middle-class prosperity. And I pointed out that taxation would be a trivial issue if Liberland came into existence and has a very small government. Seasteading, the concept of building freer societies upon unincorporated parts of the world’s oceans, is one of those so-crazy-it-just-might-work ideas within liberty/stateless circles. Long discussed, presented, talked about, mulled over, most cranks like myself mentally pocketed the idea years ago. Compelling enough, definitely, but it seemed wishful, immediately impractical. …The concept of seasteading really begins in earnest with Patri Friedman, grandson of Nobel Laureate Milton Friedman. The third generation Friedman doesn’t shy away from his famous lineage, which also includes anarcho-capitalist philosopher father David Friedman. …Mr Friedman vowed to take theory into practice. Real world. Right now. He, along with gadfly investor Peter Thiel, founded The Seasteading Institute. …The Seasteading Institute has inked a deal with French Polynesia for a trial city off their shores. It’s happening. And “special economic zones” are another example of libertarian-style governance. …two kinds of special jurisdictions — private communities and “Special Economic Zones” — are quietly taking over functions and providing options that traditional polities cannot or will not. This gentle revolution has already brought comparative wealth and better living to millions of people… In a Special Economic Zone (SEZ), a government creates exceptions to its own rules — a select haven from the status quo that prevails elsewhere in the national territory. The goal, says the World Bank, is to create a “business environment that is intended to be more liberal from a policy perspective and more effective from an administrative perspective than that of the national territory.” …The antecedents of modern SEZs date from 166 BCE, when Roman authorities made the island of Delos a free port, exempting traders from the usual taxes in order to stimulate local commerce. …The astonishing growth in SEZs qualifies as a revolution of sorts, but not the usual, political kind. Instead of being imposed by domestic or foreign enemies, this revolution has come from within, allowed or even encouraged by existing authorities. And here’s a video about Liberland for those interested. Let’s close with some wonkiness by looking at some academic research about fiscal policy and the evolution of government. We’ll start with some excerpts from Tanzi and Schuknecht’s analysis of Public Spending in the 20th Century. Classical economists thought that the government’s role should be limited to national defense, police, and administration because government “cannot have any other rational function but the legitimate defense of individual rights” (Bastiat, 1944–5). …For classical economists, the government role should be small… The countries’ institutional frameworks, such as the U.S. Constitution, did not specify any other economic role for the state. 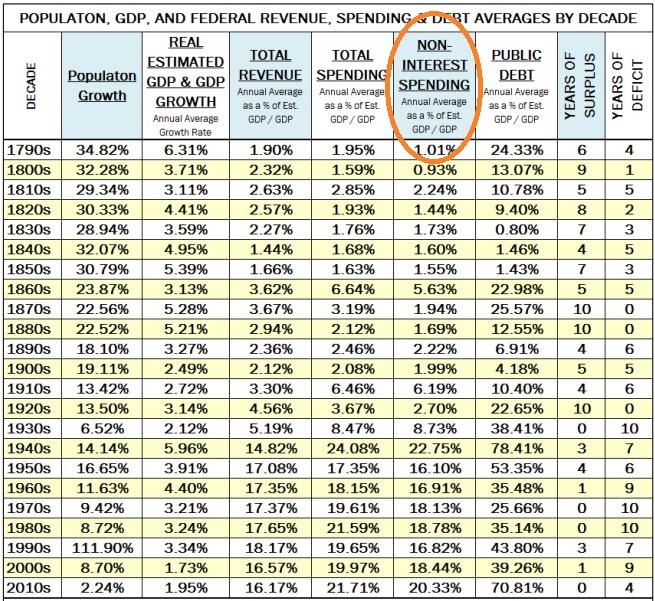 Consequently, in the last century, public spending was minimal in a number of industrialized countries for which data for 1870 could be found… In the United States, government expenditure was about 7 percent of GDP, and, in most newly industrialized European countries of the period, such as Germany, the United Kingdom, or the Netherlands, expenditure did not exceed 10 percent of GDP. A leading French economist of the time, Paul Leroy-Beaulieu (1888), addressing the question of the proper share of taxes in the economy, suggested that a share of 5–6 percent was moderate while a share beyond 12 percent had to be considered “exorbitant” and would damage the growth prospects of an economy. Hmmm, I though Bastiat was the only good French economist. But Monsieur Leroy-Beaulieu obviously is a very sensible person. Now let’s look at historical estimates of tax revenue, as presented in a study from two academics published by the London School of Economics. 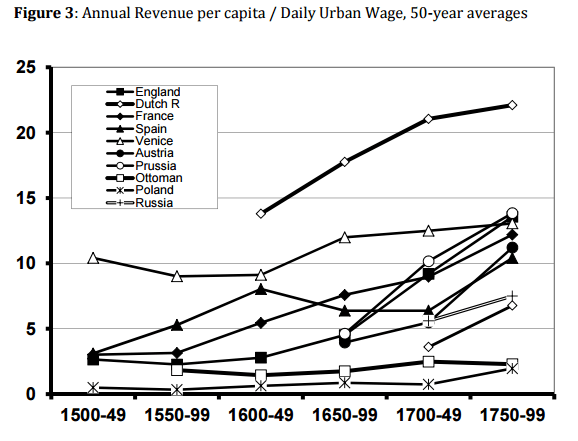 Here’s a chart from the study that gives an idea of the tax burden in various nations from 1500-1800. Last but not least, we have a very detailed study about the evolution of the state from economists at George Mason University. I’ve culled some of the key passages. Recent scholarship in both political economy and development economics has emphasized the importance of state capacity in explaining why some countries have succeeded in achieving economic development whereas others have not. This literature points to the role of state capacity in explaining the durability of institutions that are both conducive to markets and to economic growth. …This literature recognizes both that predatory behavior by states is frequently a cause of economic stagnation and that well-functioning states can provide the institutional framework necessary for sustained economic growth. … Economies governed by strong, cohesive, and constrained states are better able to overcome vested interests and avoid disastrous economic policies, while societies ruled by weak states are prone to rentseeking, corruption and civil war. State capacity, therefore, can complement market-supporting institutions in providing a conducive setting for economic development. This insight was understood by Adam Smith who noted the importance of the provision of peace, justice, and easy taxation (Smith, 1763). …Economic growth in the absence of sufficient state capacity was not self-sustaining precisely because economically successful societies attracted predators. …Greater state capacity enabled the states of western Europe to escape from this violence trap in the eighteenth and nineteenth centuries. …Well functioning markets are not only required for allocative economic efficiency, they also provide the necessary conditions for sustained economic growth over time. But markets cannot operate in an institutional vacuum. They require property rights that are well defined and enforced and rely on governance institutions that can arbitrate claims and disputes. Governance institutions do not have to be provided by a state—that is by an organization that claims a monopoly on the legitimate use of force within a circumscribed territory. Historically there are many instances of market actors developing their own governance mechanisms in the absence of state enforcement through private-order arrangements… The state is certainly not required for either impersonal trade or for the emergence of rules of behavior and the rule of law. What the historical record suggests, however, is that during the relevant centuries prior to the industrial revolution, commerce and trade came increasingly under the purview of the public-order institutions. …State capacity, as we have noted, need not promote economic growth. States with high capacity can pursue destructive economic policies. Rather the point is that state capacity can be beneficial for growth when the state is constrained by law. One of the reasons for this is that high capacity states have the ability to enforce general rules. This ability is closely linked to what social scientists typically mean by rule of law. …What enables some societies to build effective states—states that are able to provide basic public goods but which are constrained and limited in scope and scale? …The origins of modern economic growth are to be found in the expansion of market exchange and trade that gave rise to a more sophisticated and complex division of labor that rewarded innovation and to the cultural and potentially non-economic factors that helped spur innovation (Howes, 2016; McCloskey, 2016; Mokyr, 2016). The importance of the rise of high capacity states to this story is that these states helped to provide the institutional conditions that either enabled growth and innovation to take place or at least prevented their destruction through warfare or rent-seeking. The emergence of sustained economic growth in the nineteenth century was associated with strong but limited states. Twentieth century ambitions to use state power to remold societies either ended in failure or were at least partially reversed. We have focused on the recent literature linking the rise of the modern state to positive economic outcomes, but do not want to give the impression that we are neglecting how easy it is for governments to destroy economies (e.g., Shleifer and Vishny, 1998; Easterly, 2001). The core message is that the key to prosperity is having a state strong enough and effective enough to provide rule of law, but to somehow constrain that state so that it doesn’t venture into destructive redistribution policies. This is why competition between governments played a key role in the economic development of the western world. When governments have to worry about productive resources escaping, that forces them to focus on things that help an economy (i.e., rule of law) while minimizing the policies that hinder prosperity (i.e., high taxes and spending). P.S. I got a nice surprise at the conference. 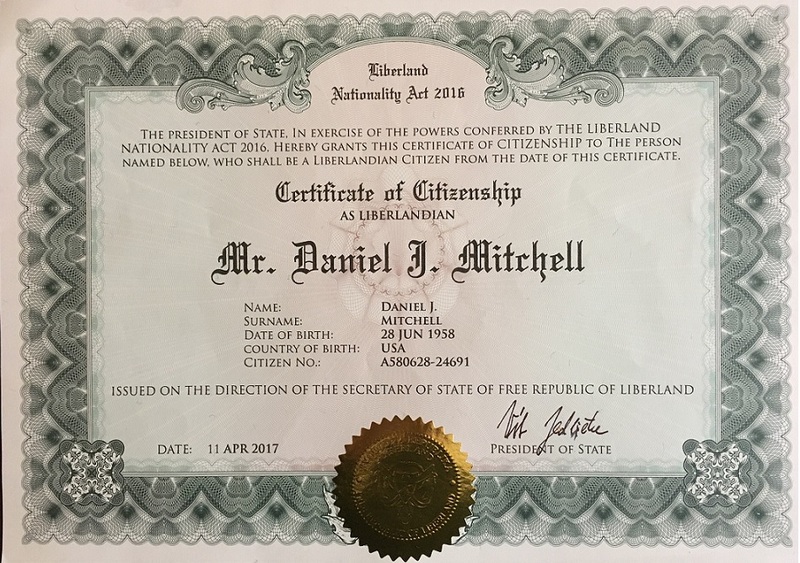 I was made a citizens of Liberland. P.P.S. America’s Founding Fathers dealt with the same issues that I discussed at the Liberland conference. Their solution was a constitution that explicitly limited the size and scope of the federal government. As I noted in my speech, that system worked reasonably well until the 1930s. Now we’ve gone so far in the other direction that the Supreme Court says Washington can compel us to buy things from cronyist companies. Avoiding the same fate will be a major challenge for Liberland. Assuming, of course, it gets off the ground. this is the problem with you so-called libertarians. you start everything with good in your heart but somewhere down the line you lose sight of everything that matters and end up saying or doing uncivilized/absurd things. if there is one group that is guaranteed to f**k things up, it is libertarians. lets look at liberland. its good looks good. until you realize and knowing what you know about europeans what stops these kind of micronations from turning into crime hubs? haven’t we had enough already with tax havens, drug havens and human trafficking havens? tell us what exactly stops a liberland from turning into a hub of child p**nography, prostitution, gun racketeering, hacking and the like? libertarian answer is well known. that’s why very few people support it. libertarian is not the future anyone can truly imagine. I advocate Meridocracy, where citizens time-share all government functions! If you choose to be a citizen, then for eleven months of the year you would engage in part-time volunteer community services (road patrols, fire and emergency services, etc.) and for one month of the year, you and all others assigned to that month would be the government, reviewing all the laws on a regular basis, and voting for them. This would only work for small scales of government like counties, but Libertopia looks small enough!